So I got Teaspoon’s biopsy results back at the end of last week. I originally thought he had a rare auto-immune disease called coronary band disorder, but it turns out that it’s an even more rare disease – how lucky am I? The new diagnosis has a long title (and I’m waiting for the vet to email me the abstract), but is essentially a form of Vasculitis. The tissue around his coronary band and his chestnuts have too many white blood cells. This means his blood vessels are inflammed, which is what is causing the strange keratin growths around his coronary band and heel. The disease’s cause is unknown, and data is sketchy at best. All my vet could tell me is that horses who have this disease in the past have responded to steroid treatment, which we are starting today. The kicker is that the disease and white blood cell count is aggravated by UV rays. Simply put – I have to keep my horse out of the sun. A horse. Out of the sun. That poses some logistic issues to say the least. Lucky for me my barn already turns the horses out at night year round, so all I have to do is try to figure out how to cover him from the sun as much as possible in the early morning / late evening when he’s turned out, and during the day in his stall. The result? 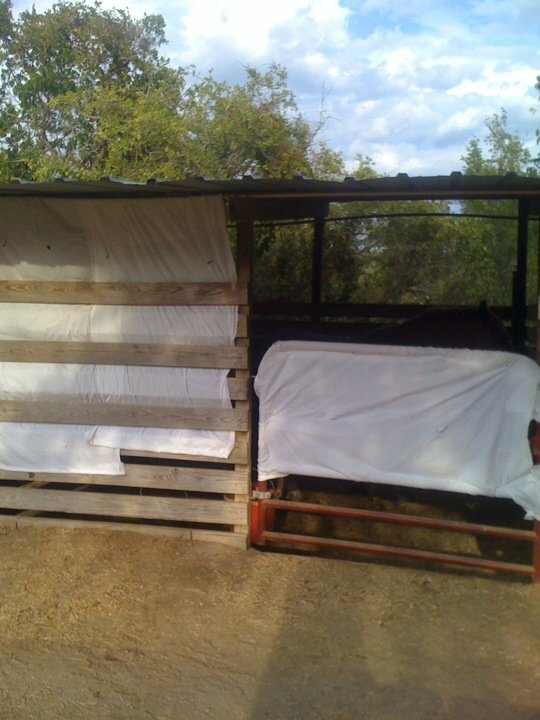 Horse stall feng shui. Here we have a lovely white cloth keeping the sun’s harmful rays out of Spoon’s stall. Of course he thinks this cloth is an evil ghost come from the past to eat him alive in his “happy safe stall”, but I think he’s slowly getting over that. I still need to get some more fabric to cover the remaining exposed areas… but this is what my life has come to. Hoping that enclosing my horse from THE SUN cures his super rare hoof disease so I might one day be able to ride him again. Sigh, at least it’s all an adventure!